Before my question I want to apologize because i'm not fluent in english. I have a concept A with some properties. I have a concept B with an integer named b. In the generation, I want to transform my concept B in b concept A. Then, I want to use TextGen for the model-to-text transformation. But, I dont't know if I can do this and how do this. I tried to add some rules in the generator but this don't worked. Do you have some ideas? could I ask you to explain the desired transformation, please? What should be transformed into what? Maybe an example could help. I put the model in the attachement. In fact, I want to transform the Exception concept in a Decision Concept. 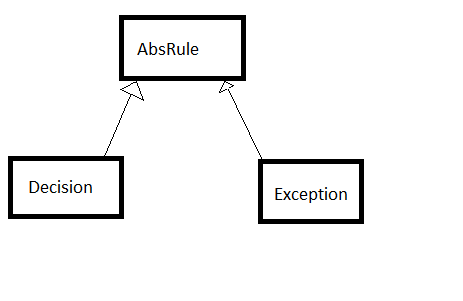 (The user manipulate the concept of exception. However, in the target code, this is transform in a specific decision in wich I define "manually" all the properties. To make a model-to-text transformation I use TextGen. In the generator, I try to use the "weaving rule". But I don't understand what must return the "context". Currently I make a pre-script. But I'm not sure that is the good solution. ... some actions that I define "manually"
And then we give this code to TextGen. I may have misunderstood, but to mer this looks like a use-case for the COPY_SRC macro that would replace Exceptions with Decisions. This should give you a solid introduction into the generator capabilities.